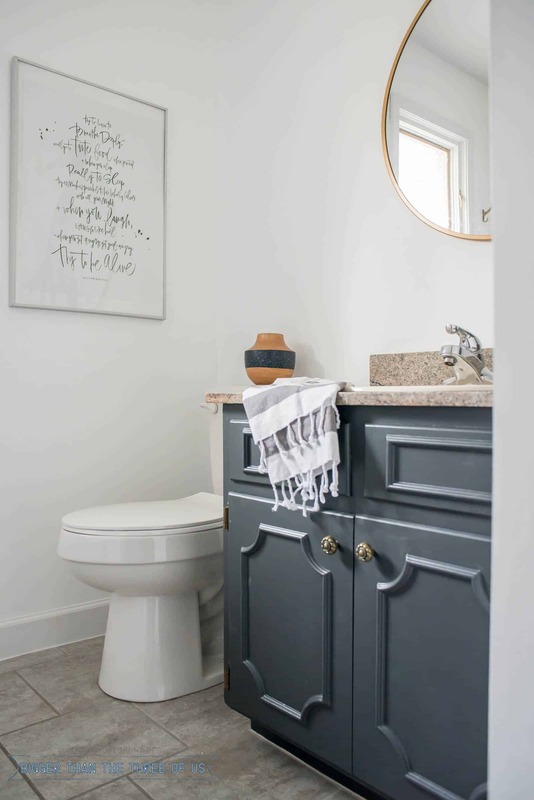 It’s reveal week for the Budget Friendly Bathroom Makeover for the $100 Room Challenge hosted by Erin from Lemons, Lavender and Laundry. 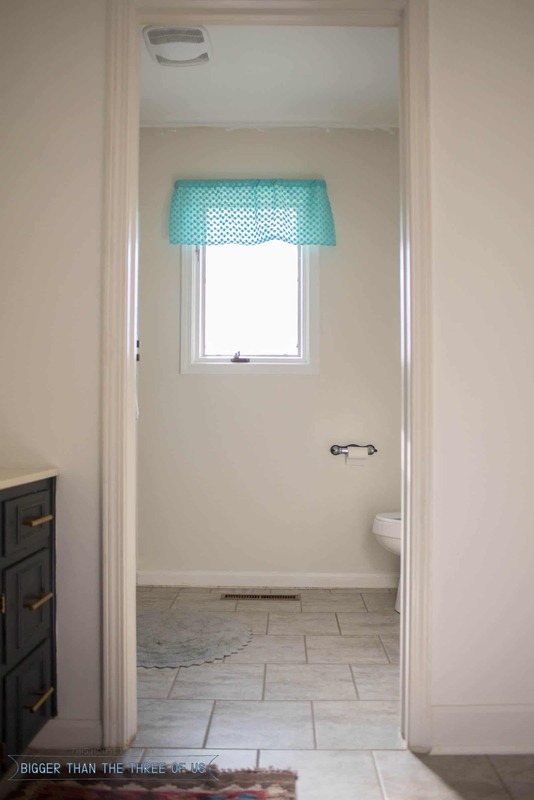 I didn’t get everything that I wanted done and I went over budget BUT our bathroom is looking so much better than before. As with all the other weeks, I put together a video for you to check out. I’d love for you to subscribe to my channel on YouTube. If you are like me then you always love to see as many before and after’s as you can. So, let’s take a look at a few more before I jump in to all the details in the space. 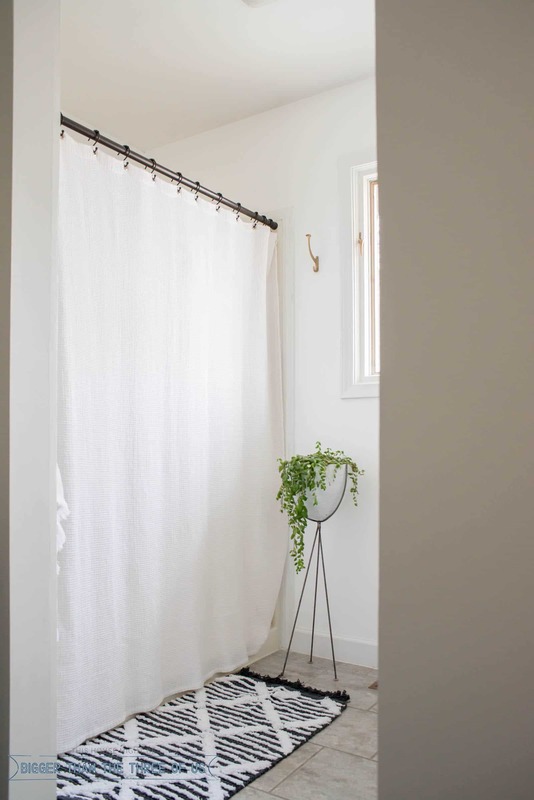 As you can see, getting rid of the dated, disgusting, glass shower doors was one of the best things we did for the space. Seriously, the change is crazy awesome and that’s with a thrifted shower curtain that is too small for the width of the shower stall. 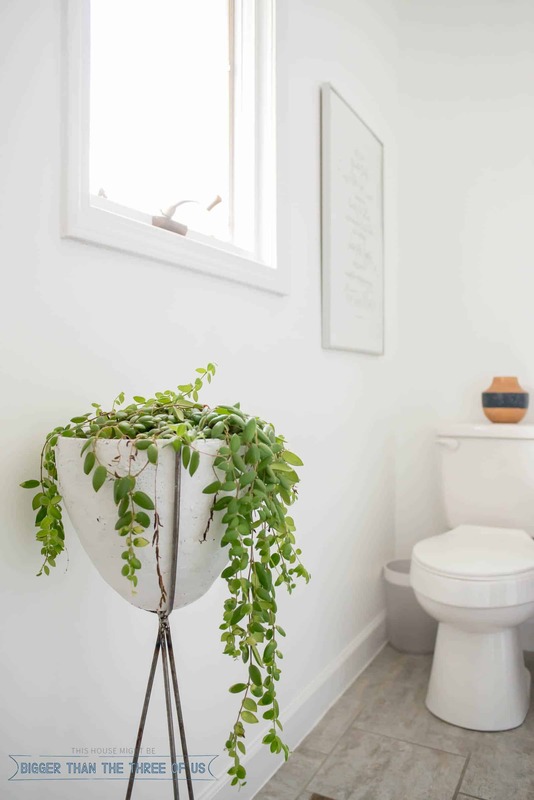 Adding a graphic rug over the peel and stick tile with grout (this was a SUPER SIMPLE DIY from years ago) and the tall bullet planter (another DIY from years ago) added so much interest to this side of the bathroom. I’ve aways been a lover of quotes and sayings and so a few years ago, I bought this Williams Saroyan print off of Etsy. It used to sit on the gallery wall in the living room but when I took the gallery wall down, the print just didn’t have a home. I was happy to find a new home for it. The bathroom vanity doesn’t look quite as good as I had hoped. 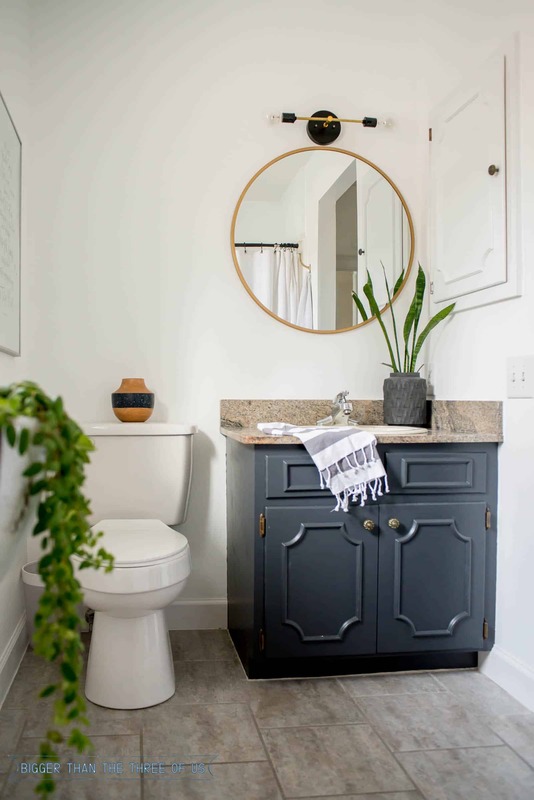 To be honest, during the last $100 challenge, I made over the adjacent bathroom nook and that bathroom vanity ended up looking decently modern. 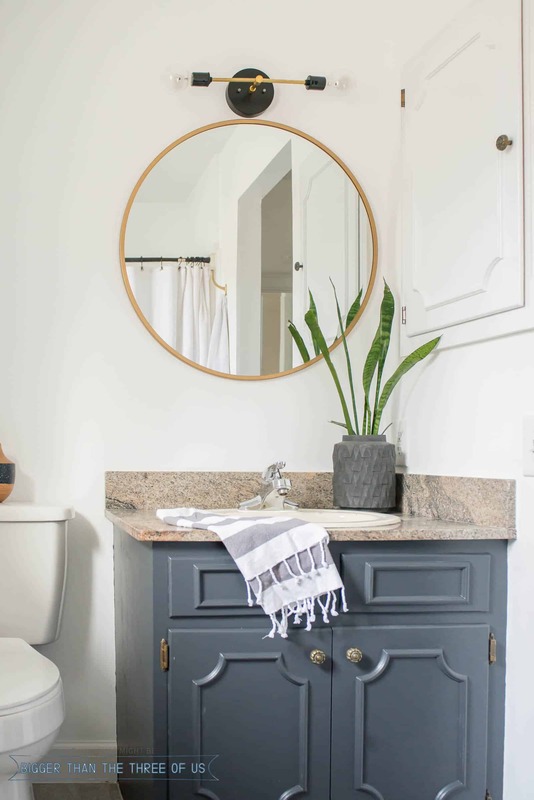 I was hoping to pull of a similar look with this vanity but the granite top and cream sink make it look more traditional. So, that’s a bit of a negative for me BUT the bathroom as a whole looks so much better that I can’t complain. The round mirror was one that I had on hand. It used to sit over our dresser in our master bedroom. Check out the master bedroom reveal if you are curious; but I had wanted a new look over that dresser for awhile. So, it was a perfect time to make a change in there. The light is a $30 DIY that I originally made for the last challenge. Get all the details on the light in the Modern DIY Light post. The few other pieces of decor were plucked from other rooms. If you followed along on the other weeks, then you know that I was already over-budget. Well, I thought I had enough paint on hand to do everything on this project, but we ran out! So, I had to get a can of paint this week and that put me even more over budget. 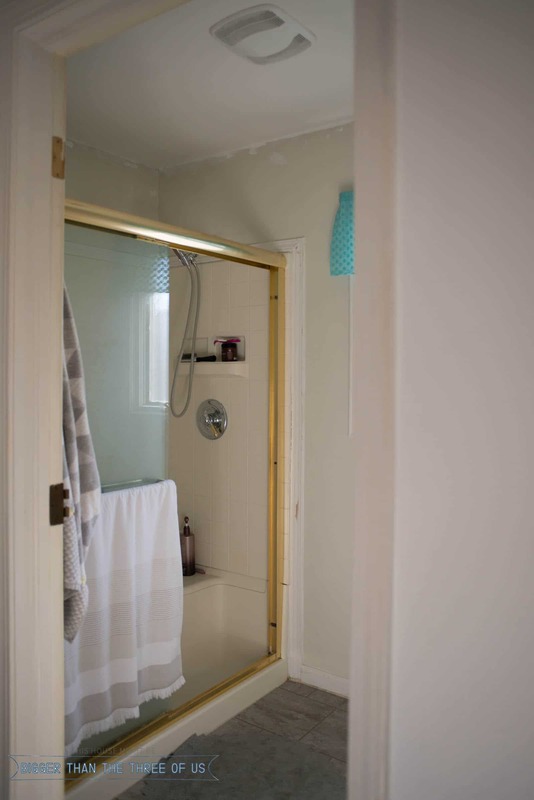 Still though, for $143.81… dang, doesn’t that bathroom look crazy different? 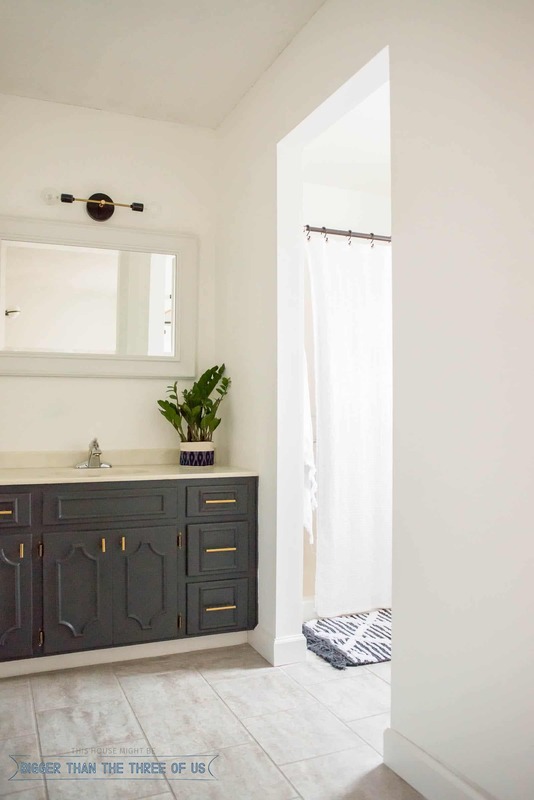 It’s by no means my dream bathroom, but we didn’t have a budget for anything else at this time so I’m incredibly happy with the bathroom for that budget. Make sure to catch-up with all the other reveals!